The Wilson Combat Q-Comp has been designed by our compensator experts to greatly enhance recoil control in rapid fire without the harsh blast and flash that other AR-15 muzzle devices exhibit. 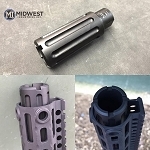 The Q-Comp is a hybrid AR-15 brake/compensator that has been tuned to minimize side-blast and concussion compared to other muzzle devices on the market. This exclusive Wilson Combat design displays almost zero muzzle flash yet retains excellent vertical and rearward recoil reduction with all calibers. The slotted expansion chamber design of the Q-Comp has no prongs or tines to break off or snag and is Melonite QPQ coated alloy steel for maximum durability and corrosion resistance. The Q-Comp is easily installed on your AR rifle using the included crush washer.